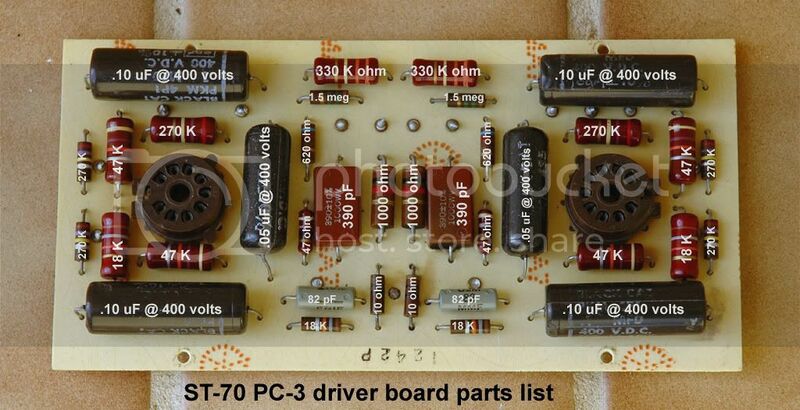 Dynaco never gave a parts layout on their PC-3 driver board for the ST-70. 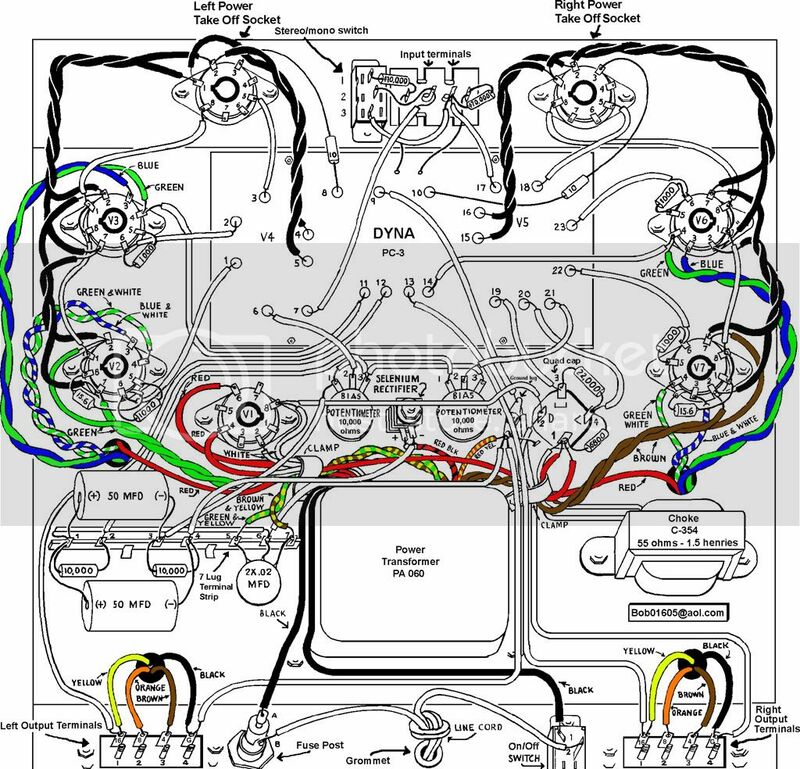 They also never listed the parts that were on the driver board in the main parts list for the amp on page 11 of the ST-70 assembly manual. All they said in the parts list on page 11 was that you got a "Printed Circuit Assembly - PC-3 part #557003". When you got your ST-70 kit the driver board was already preassembled. In the photo below you can see the value of every resistor and capacitor on the PC-3. The photo is of one of the fiberglass PC-3 boards that Dynaco started using in the last few years of production. If you have one of the older "brown" PC-3 driver boards, the parts layout is identical. Thanks very much for the picture. I just obtained a ST-70A sans EL-34s (the seller would not include these!) and I am looking to replace the quad can and the caps on this board. I assume I would replace the same values but opt for higher voltages? Any recommendations on capacitor quality (brand) and voltages? Hirak wrote: Thanks very much for the picture. 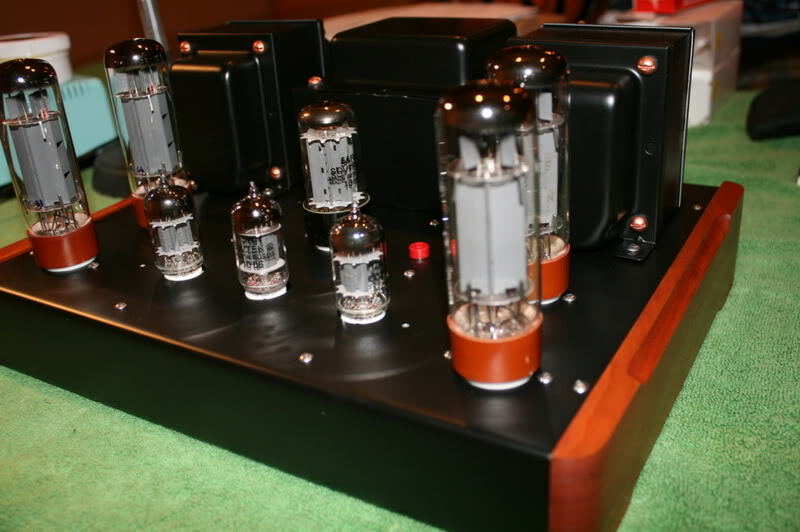 I just obtained a ST-70A sans EL-34s (the seller would not include these!) and I am looking to replace the quad can and the caps on this board. I assume I would replace the same values but opt for higher voltages? Any recommendations on capacitor quality (brand) and voltages? The BEST can capacitor you can put in there as a replacement quad cap for the ST-70 is the Dynakitparts 80, 40, 30, 20 uF 550 rated volt quad cap. Kevin at Dynakitparts has them made by F&T capacitors in Germany. I use one in my own ST-70. They are $60 each but worth it in the long run. When you install this cap just have the "80" section face the back of the amp and all the other sections will be in the correct position. This cap has almost double the DC power storage of the original Dynaco quad cap. As for cap sizes > With the four main coupling caps on this board (which are .10 uF @ 400 volts), you can go up to .22 @ 400 volts or .22 @ 600 volts. On the two .05 @ 400 volt caps that are beside the two tube sockets you can go up to .10 @ 400 volts. Nice caps for the money in both positions (and caps that will fit the two positions very well) are the SBE 716P "orange drop" caps. Antique Electronic Supply sells these. If you plan to replace EVERYTHING on an original driver board IMHO you are probably better off just getting a NEW DRIVER BOARD AND PARTS SET from Dynakitparts with metal film resistors. ($50) Metal film resistors hold their tolerance a lot better than the old carbon composition resistors as found on the original ST-70 board and are nearly always quieter. The parts set with this board includes 600 volt rated capacitors. No side effects that I have seen. The 4 main coupling caps on the ST-70 "should have been" (IMHO) .22 uF @ 600 volts. 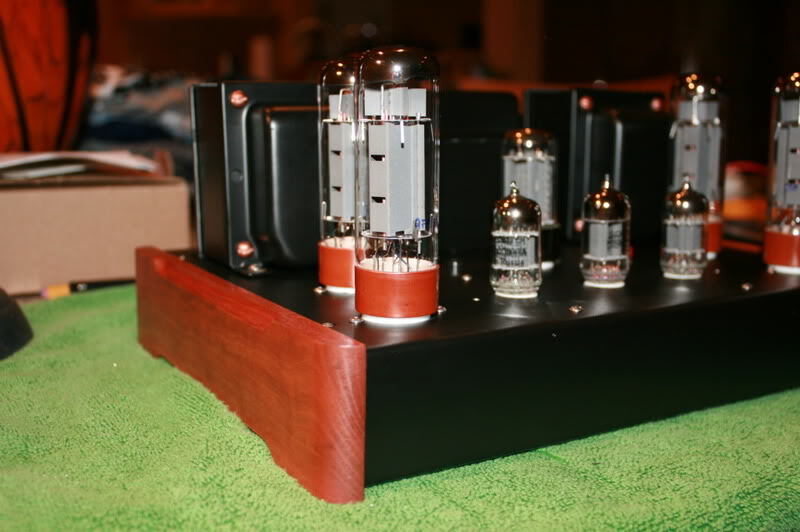 Dynaco saved a few cents on each amp by using the .10 uF @ 400 volts. I think the .22 uF cap may also help give a stock amp a little better bass response and the 600 volts cap will stand up a little better to the high voltage on one side of the cap. The only minor disadvantage is that many .22 uF @ 600 volt caps will be a little larger. Nice caps for the money that would work here are the SBE 716P .22 @ 600 volt "orange drop" caps sold by Antique Electronic Supply. They are larger than the stock caps but will fit OK onto a stock board. You just bend the leads to fit . For the 390 pF cap a 500 volt rated cap is more than enough. A silver mica cap IMHO is best here. I think you mean the 7 lug terminal strip under the LEFT output transformer. Bob : I just purchased the VTA board from Roy . Can I use the F+T quad cap you recommend 80,40,30,20 ? sventube wrote: Bob : I just purchased the VTA board from Roy . Can I use the F+T quad cap you recommend 80,40,30,20 ? Yes - You can ... When you put the F&T cap in there to replace the original quad cap just make sure that the "80" section faces the back of the amp. If you do that then all the other sections will be properly oriented. I plan on replacing the entire board when funds become available - but in the meantime, it's nice to hear your expert commentary on upgrading the original. I just ordered the 716p Orange Drops and Silver Mica caps at your recommended values. Thank you very much for providing this information. Kuma wrote: I plan on replacing the entire board when funds become available - but in the meantime, it's nice to hear your expert commentary on upgrading the original. I just ordered the 716p Orange Drops and Silver Mica caps at your recommended values. The 716P "orange drop" caps are large and will stick up higher than the stock caps. Just bend the leads to fit the holes in the driver board. If you do ever replace the stock board IMHO it is best not to use the stock circuit. The stock circuit with 7199 tubes is not linear at all drive levels. 7199 tubes are also extinct. No one makes them anymore. The only source of these tubes is what is in circulation right now. IMHO if you do replace your driver board at some time in the future, you would be better off to use one of the VTA upgraded driver boards. It has a number of advantages over the stock driver board like ..
2. No open solder traces and all eyelets have plated through holes so that components may be placed on the top or the bottom of the board. NOTE (on 4/20/18) - All VTA amps since April of 2012 now use just the LOW GAIN board which uses 12AU7 type driver tubes. Beside my ST-35, I just purchased a ST-70 with original PC board. (latest version as you described above), I am thinking of replacing the original BalckCat coupling caps with PIO caps, namely Jensen. As I expect sweeter, mellow and warmer sound from them. Any other options. Shall I go for.22 (4 units) amd .1 (2 units)? How Jensen compared to Orange Drop 716P ? 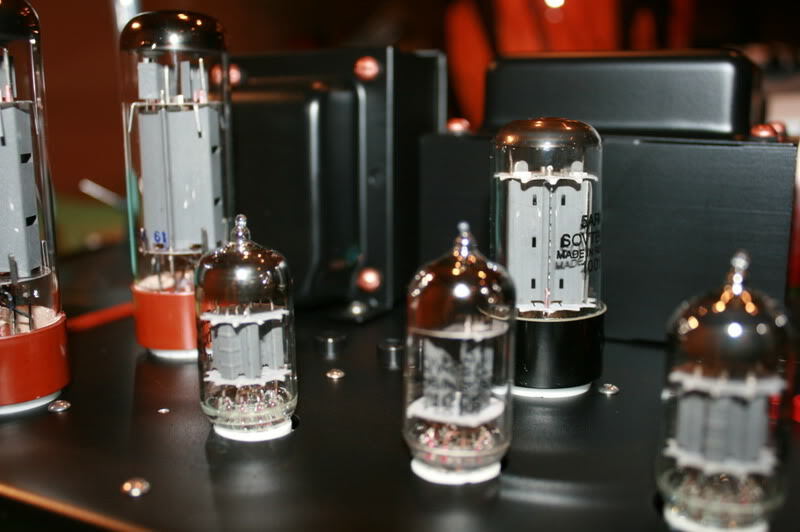 Jensen makes a few different types of audio capacitors. I have never personally heard any of them so cannot comment on their sound. The 716P orange drop caps are very good caps and are inexpensive at $1.50 - $2.00 per cap. I would go one size up as you mentioned with four .22 uF caps and two .10 uF caps. Check with Kevin at Dynakitparts. He should have the board layout for the Mark IV. Great info and photo for replacing parts on my original board. I don't know from this, however, what the power ratings on the resistors should be. Can you point me in the right direction for either original specs, or your recommendations? The 270K, smaller 18K, 620 ohm, 47 ohm, 1.5 meg and 10 ohm are all 1/2 watt resistors. All the other resistors on the board are 1 watt. I recommend metal film resistors since they are quiet, don't change their values over time and can be had in 1% values so that the two channels can be closely matched. Bob, can you let me know dimensions of st70 without cage please. I have about 6 1/4" opening in my shelf. Hope this unit can fit. The amp is just about 6 1/4 inches high but I would not place the amp in any small space where there would be restricted air flow. These amps should "look at the ceiling" IMHO. Placing the amp in a confined space can cause the amp to run hot and could damage the power transformer. This is how my project looks now.. The original Dynaco ST-70 PC-3 board was 6 1/2 inches long by 3 1/4 inches wide. Hi, I realise this is an old thread. I am considering updating the coupling caps as noted (.22 & .1) I was hoping that I could get some opinions from people who have done this! Please let me know the pros and cons. The bottom line is it worth doing? Does the sound improve. Can anyone define "improved bass responce" = deeper or tighter bass or...? is it worth doing? That's a totally subjective topic. Each person hears things differently. I recommend you start with a reasonably priced upgrade, like 716P capacitors, under $2 each. Some people like Solens for about the same price (brighter sound, not as warm). A high percentage of people really like the russian PIO caps we have on our website, for around $6 each. I'm a big believer in value for the $$. Other people can't live with anything less than $75 (each piece) Mundorf caps. Hi, thanks for your input. Can you give me a link to this site that sell the PIO Caps?